Apple CEO Tim Cook was seen on Wednesday China local time, visiting an Apple reseller during his recent trip to the country. 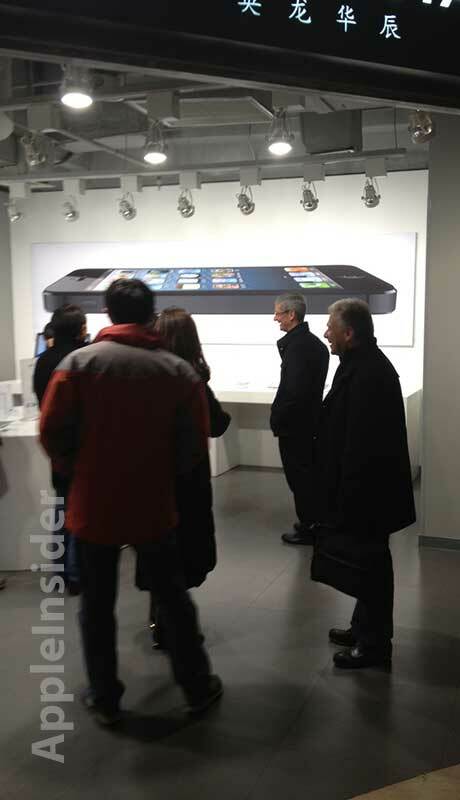 The photos, shared by AppleInsider reader Anthony, show Cook talking with staff at Dragonstar, an Authorized Apple Reseller located in the upscale China World Shopping Mall, which is attached to the China World Trade Center in Beijing. While it cannot be confirmed due to the image's resolution, it appears as though a second man in the photo could be Apple's Senior Vice President of Worldwide Marketing Phil Schiller. It was reported on Monday that Cook met with China's head of industry and information technology Miao Wei to discuss Apple's business in the country as well as the global communications market as a whole. This is the second trip to China for Cook in less than ten months, as the Apple chief visited an iPhone production facility run by manufacturing partner Foxconn last March. During that trip Cook discussed intellectual property issues and potential cooperation with the Chinese government with Vice Premier Li Keqiang.